Thank you to everyone who joined us for the 2019 Women’s Re(treat) at the Fairmont Hotel MacDonald on March 2, 2019! You are part of what makes an event like this one so successful and extraordinarily special. The 2019 theme was inspired by three pillars: mind, body, and soul. We wanted to emphasize the importance of taking care of and investing in yourself. And we had the privilege of hosting passionate and talented speakers to help us make our vision come true. - Local networking expert Nadine Riopel shared practical advice for introverts on how network to create meaningful connections. - To discuss leadership and mental health, Jocelyn Davison (The Virtual Effect) and Jamie Bay (The Wellness Warrior) discussed mental health in the workplace and the benefits of mental health panels and workshops. 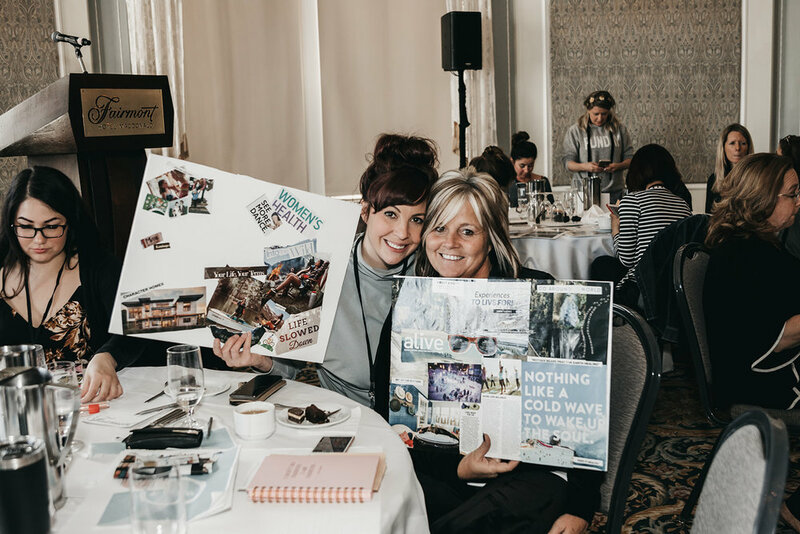 - Local blogger Nicole Constante discussed the power of vision boards as practical motivational tools and guided a hands-on workshop. - Our panel about women’s health included Justine Martinson (Lipstick Empire Laser Spa) and Chantel Eves (Health Plus Happy), who were able to shed light on self-care and the misconceptions of aesthetics. - Gayatri Joti (Shift Clarity) discussed the benefits of meditation and yoga, and then guided a seated session for deeper self-reflection and connection. Thank you to all the volunteers and to the Fairmont staff who helped the day run smoothly. In a society that profits from our self-doubt, loving ourselves is a revolutionary act. We are stunned and appreciative of the support we’ve received to make this fun and inspiring revolution possible. Thank you Nicole Constante for all the amazing photos!